New video released by the NYPD shows the beginning of an altercation between members of the far-right group the Proud Boys and demonstrators protesting the a speaking arrangement for the group's leader Gavin McInnis. Marc Santia reports. 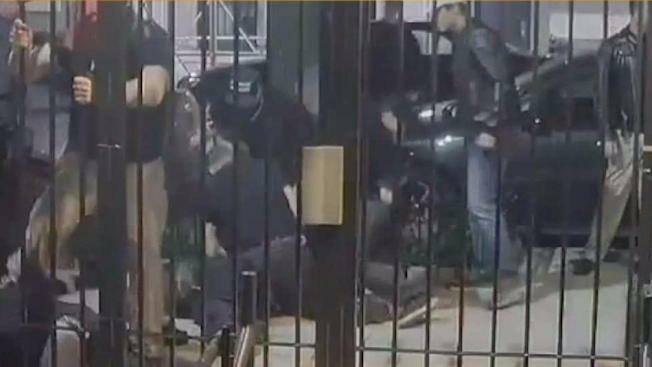 New video released by the NYPD shows the start of an intense Friday brawl between members of the far-right group known as the Proud Boys and demonstrators protesting a speaking arrangement of the group’s founder. The two groups squared off on 82nd Street when a person with a mask seen on the left of the video —believed to be an alleged anti-fascist activist — throws a bottle. Suddenly, people on the right, believed to be alleged supporters of the right-wing Proud Boys Group rush in throwing punches. Both sides end up throwing fists and kicks with many falling onto the sidewalk. “When uniform scooters arrive on the scene, they immediately disperse and you can hear people in the video yelling, ‘Stop! Stop!’” NYPD Chief of Detectives Dermont F. Shea said. The violence spilled onto other corners on the Upper East Side – all of it happening after Gavin McGinnis, leader of the Proud Boys, identified as a hate group by the Southern Poverty Law Center, was invited to speak at the Metropolitan Republican Club. The male-only Proud Boys describe themselves as "western chauvinists." No serious injuries were reported in the aftermath of the massive fight. However, three were arrested and now the authorities are searching to question many others in connection to the brawl. Though there is still an active investigation into the altercation, on Monday, the NYPD lashed out at both sides for refusing to cooperate with the police investigation. Authorities have also shared on social media a call for the public to assist investigators in identifying persons of interest in connection to the fight. However, as of now, it is unknown if the individuals in the photos shared by police are protesters or Proud Boy members. The three arrested face assault charges and were released on recognizance after an arraignment Saturday in Manhattan criminal court. Police spokesman J. Peter Donald said the department was reviewing video and would make other arrests as warranted. Some elected officials — including Public Advocate and attorney general candidate Letitia James and Gov. Andrew Cuomo — expressed outrage over the violence and blamed the Proud Boys. On Sunday, Cuomo asked the FBI to launch an investigation into the violence.